Dental assistants perform various duties related to the dental office, patient care, and the dental laboratory. They gather and update dental records and disinfect, sterilize, lay out, and prepare materials and instruments used for treatment. During a dental procedure, the assistant helps the dentist, handing over materials and instruments and using suction to keep the patient’s mouth dry. As directed, the assistant may process x-rays, use impressions to make casts of the mouth and teeth, schedule appointments, handle billing, and order dental supplies. 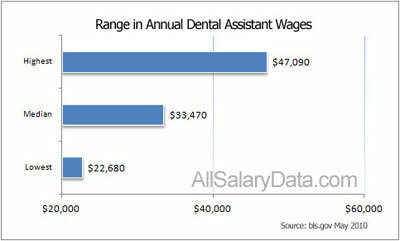 Mean annual wages for dental assistants was $34,410, per the Bureau of Labor Statistics as of May 2010. The lowest ten percent of workers earned $22,680 and the highest ten percent had an annual salary of $47,090. As one would expect, dental offices have the highest level of employment for these individuals. Trailing far behind are physician offices, the executive branch of the federal government, universities, colleges, and professional schools. Speciality hospitals, the federal executive branch, state government, substance abuse and psychiatric hospitals, and general medical and surgical hospitals represent the highest paying industries. Dental assistants in the District of Columbia, Alaska, New Hampshire, Minnesota, and Connecticut are paid the highest mean annual wages. Utah, Alabama, South Dakota, and Louisiana are a few of the lowest-paying states. Job prospects for dental assistants are predicted to be excellent between now and 2018, reports the Bureau of Labor Statistics. A 36 percent growth in employment is anticipated, making this one of the fastest growing occupations between 2008 and 2018. Both entry level and experienced positions will be available and the metropolitan areas with the highest level of employment in May 2010 were Los Angeles, New York, and Chicago. Most states do not have formal training or education requirements for entry level dental assistants. In the past, many individuals learned on the job. In recent years, trade schools, junior and community colleges, the military, and technical institutes have begun offering dental assisting programs that last for one year. To assume more advanced roles or perform radiological procedures, a certification or license may be required by the state. Fourteen percent of respondents to a recent O*Net survey of dental assistants had a high school diploma or equivalent, seven percent had an associate’s degree, and 72 percent took some college courses but did not graduate with a degree. High school students interested in a career in this field should take classes in health, office practices, chemistry, and biology. The Commission on Dental Accreditation (CODA) approved 281 training programs for dental assistants as of 2009. Included in these curricula are classroom study, lab work, and preclinical education in skills regarding dental assisting and relevant theory. It is important to note that four to six-month dental assisting programs offered by private vocational schools are not CODA-accredited. Some junior and community colleges offer two-year associate degree programs. Duties falling under the realm of dental assistant are usually regulated by the state. Registration, licensure, and continuing education may be required. The Dental Assisting National Board (DANB) administers the credential of Certified Dental Assistant (CDA), which is required or recognized within at least 37 states. Additional training and certification, such as the DANB Radiation Health and Safety examination, may be required for those who perform radiological procedures. Even though the national economy is in recovery, there are still plenty of communities that have great opportunities for dental assistants. Your specific area might not offer much in terms of salary potential, but you never know what the town down the road promises in the way of earning potential. For dental assistants, certain states promise higher salaries than others. But individual cities have their own unique economic climates. You could be close to a town with high potential for the field. For example, Framingham, Massachusetts and the surrounding area is one of the highest paying communities for dental assistants in the country. In fact, it is the highest paying area on record. Dental assistants in Framingham can earn as much as $47,780 a year on average. The Santa Rosa area of California is in 2nd place, where dental assistants earn an average of $46,340 annually. The Lowell and Manchester areas of New Hampshire promise impressive average incomes of $44,260 and $44,230 annually. Alaska consistently ranks high in terms of job market and earning potential for dental assistants. Anchorage is the most prominent area for dental assistants who earn an average $42,270 in that area. Meeting your income goals means choosing a lucrative career. But it also means selecting the best community in which to pursue that career. With a bit of research, you can maximize your income and get the most out of your education and job training. High employment levels can be a sign of a strong local economy. In times like these, a strong economy can be a major selling point when you’re thinking about a new career or a new home town. High employment levels mean people in the area are working and earning money. In turn, this means they are putting that money back into the local economy in terms of goods and services. That’s a good thing for almost any industry. While there may be other areas in the country in which dental assistants have more earning potential, money isn’t everything. These are the strongest communities in terms of employment and you can see that job levels don’t always correspond with income. But such strength can still have long-term benefits. Vallejo-Fairfield, California enjoys high employment levels and also offers dental assistants a competitive median salary of $36,170 annually. Yuba City, California is next with a median salary off $33,230. Corcoran and Chico, California are in the middle with annual salaries of $30,970 and $27,640. Dental assistants in Provo-Orem, Utah earn the least of those living in the top five metropolitan areas with an annual income of $26,820. But that doesn’t mean you should forget your life-long dream of living in Provo. Cost of living is a very important factor in deciding what these figures really mean. Areas like Chico and Vallejo can be very expensive to live in and that high salary might not go as far as you think. Dental hygienists examine patient gums and teeth, remove tooth deposits, and provide preventative dental care. Individuals who assist occupational therapists offer rehabilitative services to patients with developmental, emotional, physical, or mental impairments. Surgical technologists, also called operating room technicians, work under the supervision of registered nurses, surgeons, or other surgical personnel and provide assistance with surgical operations like passing instruments, cutting sutures, and applying wound dressings.